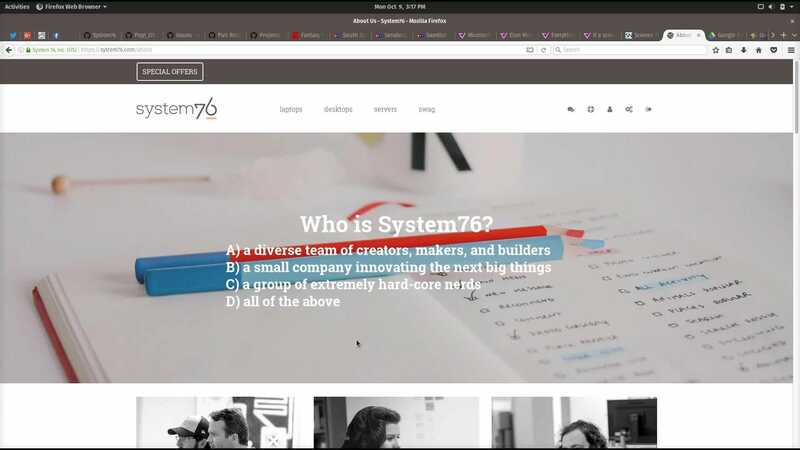 System76 is built on web technologies your browser doesn't support. If you have questions about an order, or require support, feel free to contact us. RTX 20-Series GPUs are Here! Venture far with Darter Pro’s exceptional battery life. Bring your personal office on a remote-work excursion and remove outlets from your sightseeing list. Style and mobility harmonize for a professional look on the go. The ultra-thin, featherweight chassis holds strong without holding you back. Productivity features such as integrated notifications, offline content, and background syncing work in tandem with native apps for a cohesive, streamlined experience on Pop!_OS. Tactile feedback provides the feel of mechanical keys within a chiclet design. Add an aura of style to your keyboard with the multi-color backlight. Marvel at vivid graphics, crisp text, and true-to-life color that breathe life into Darter Pro’s 15.6" Matte IPS display. Take advantage of a versatile arrangement of ports, such as an SD card slot and microphone jack that are perfect for content creators. An HDMI and Mini DisplayPort bring you from desk to conference room seamlessly, and a variety of different ports will keep you armed for any scenario. Base weight. Varies on configuration. Copyright © 2019 System76, Inc. * Financing issued by WebBank, member FDIC and serviced by Klarna. See terms. Intel, the Intel Logo, Intel Core, Iris, and Xeon are trademarks of Intel Corporation or its subsidiaries in the U.S. and/or other countries.